MARK MAGAZINE esplora i confini dell’architettura e anticipa il futuro del settore. Questo numero, come chiaramente annunciato dalla copertina, lancia un’occhiata di ampio respiro sull’architettura residenziale giapponese contemporanea. 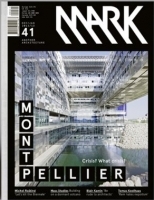 There’s no sign of slow down for Montpellier, with the French boom town awash in big-name architects and major projects. From Jean Nouvel’s city hall, to a school of management by Massimiliano and Doriana Fuksas and a library by Zaha Hadid, we profile a city with an eye for tomorrow. From Venice, eight architects – from Norman Foster to Kumiko Inui – give us their thoughts on the Architecture Biennale’s best and brightest. Finally, Adjaye Associates inject spirit into Washington D.C.’s design scene with a pair of libraries in low-income neighbourhoods.